If your kids do not like to read. I suggest you get them this book. They will love it! When I received a copy of The Bug Barians® I thought it was such a cute book! I loved it. My step son did too. Once he started to read it he didn't want to put it down! Which is huge! My step son isn't much of a reader. So when I found a book he liked, it have my vote! Here is a little about The Bug Barians®. The Bug Barians® is a cute adventure story. Clonk is a Bug Barian that is named for how he always gets into trouble. The book is about an adventure the Bug Barians go on to find food and Clonk messes up and leads them on a fun filled and action backed adventure. When my son had heart surgery. I took this book into him to read while he was in the hospital. He liked it and thought it was a super cute book. His favorite Bug Barian was Clonk. He said it reminded him of his mom (me).It was nice having my son cuddled up to me after his surgery. And being able to read with him was nice. If your child likes to read books that is fun filled and full of adventure. Then I suggest you head on over and order The Bug Barians® today! Start a summer book club with your child's friends, pint-sized relatives or neighbors 8 to 12. This is the time period where boys often lose interest in reading books. "Onward and Awkward!" If you hear those words, you know that Clonk the Clonkerer and his Bug Barian freinds are on the loose. This means only one thing. You're about to be conquered in the best way possible - with Viking fun. Better yet, it's Bug Barian fun. The book introduction could not be any more true. This book is filled with fun characters like The Mighty Huntoon, Flo, Thor and Eddik The Dread. THis is one funny troop of bugs as they love adventure and put fun into reading for kids. They are a bit awkward as I don't think they could find their way out of a paper bag, but it leads to the fun and humor in this book. The Bug Barians is written for ages 4 and up and is charming and fully illustrated filled with fun characters and exciting adventure. The Bug Barians®: Adventures in City Park (Book #1) is story about viking bugs who go off on an adventure on their boat, the “Leaf Erikson”. Some of The Bug Barians® are Clonk the Conquerer, The Might Huntoon, and Valleri. They also have a cute pet aphid called Thor. Along the way, they meet a squirrel, a duck, and an unruly kite. Where will they go next? 1. What do you think of the cover and/or the pictures in the book? I love the pictures because they are very bright and colourful. I like the picture of the Leaf Erikson the best because it’s pretty. My favorite bug is Thor the aphid because he’s the smallest and the cutest. 2. What is your favorite part of the story? My favorite part of the story is when the duck flaps its wings and they end up flying through the air. That sounded like fun. I want to fly too. 3. What is your least favorite part of the story? In the picture of the duck, the letter ‘d’ looks more like an ‘o’ so it looks like it says ‘ouck’! 4. Overall, what did you think about this book? I really liked the book. 5. Who do you think would like this book? I think kids 3 years and older would like this book. My Thoughts: Author Marty Byk and illustrator JoAnn DiMaggio have created an original, quirky cast of viking bug characters who embark on a series of adventures. The Bug Barians® each have a unique name and personality to match. 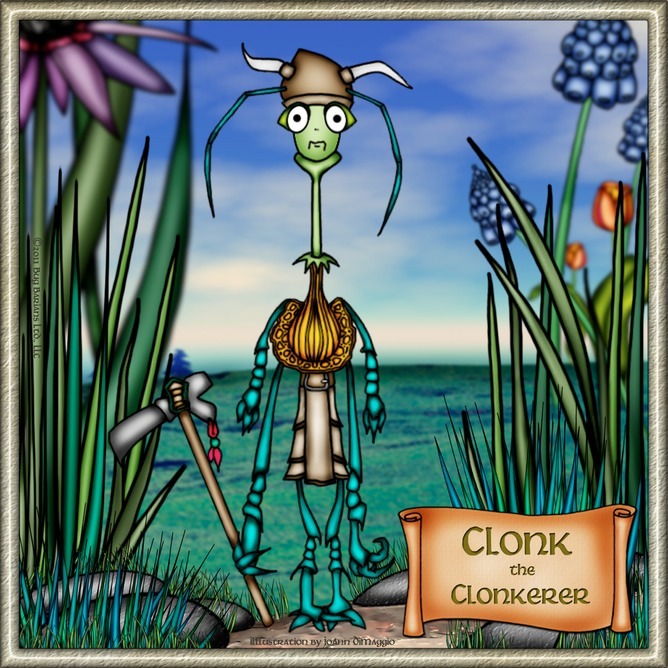 For example there is Clonk the Clonkerer – he is the clumsy one and The Mighty Huntoon, their fearless leader. There is even a representation of diversity with the inclusion of a Jamaican Bug Barian named Eddik the Dread and a female Bug Barian, (Flo) who is portrayed in a non gender stereotypical way (i.e., she uses her muscular strength to save herself and her friends). The illustrations are absolutely amazing. Each of the Bug Barians® has their own unique look. I think their depiction of “viking bugs” is very kid-friendly and really very well done. My only complaint in this respect is that, at least in the version I have, the illustrations did not necessarily go with the text. Rather, the illustrations were evenly distributed throughout the text. So, for example, the illustration of the cleverly named boat, the “Leaf Erikson”, appears on page 21, but it is first mentioned on page 8. This may only be the case in my review copy however. With respect to the characters and the illustrations, I think that this series demonstrates much potential in developing into a children’s book series that young children will surely enjoy. I say “potential” because I did have a few issues with the book. The biggest issue I had with the book is that it did not have a clear start, middle, and end. I felt that we met The Bug Barians® in the middle of an adventure and they then go on to have a series of other “mini-adventures”. The book ends with a promise of more adventure. In addition, the text was quite lengthy for young children and even my son (who is 6) sometimes lost concentration as I read the story. In essence, it felt like the purpose of the book was more to introduce the characters rather than to have one continuous and engaging story. That being said, the introduction of John Gabriel, the human boy who indicates he knows the Bug Barians (but did not directly interact with them in this story), did seem out of place in the story. The end result of not having a clear storyline is that I could not pull out a clear underlying message other than the importance of camaraderie and kinship as demonstrated amongst The Bug Barians® and the spirit of adventure. I do have to mention that there is a lot of onomatopoeia included in the text, which is GREAT when you are reading the book out loud to children. My only complaint is that some of the onomatopoeia does not match what you would hear in the real world. For example, the squirrel roars (“ROOOARRR!”) and the pet aphid Thor barks (“RUFF! RUFF!”). Perhaps the author meant for this to be absurd and for kids to giggle about. Well, the duck does “quack”! My Bottom Line: The Bug Barians® features a wonderfully-illustrated and highly original cast of viking bugs who embark on a series of (mis)adventures in the City Park. The purpose of the first book in the series is primarily to introduce us to the six main Bug Barians; and, I did feel that a solid plot line was missing in this book. Despite this shortcoming, I do think that this book series has a great deal of potential in entertaining children 5 years and older. After all, my 6 year-old did say he really liked it! Deep in the lush grass of the park are five bugs known as The Bug Barians®. Clumsy Clonk stole an acorn, and now the bugs are running as fast as they can. They are running away from an angry squirrel who wants his acorn back. If only the Bug Barians can make it back to their boat, the Leaf Erikson! And this is only the start of their adventures. Set sail with this funny crew of little Vikings. Cross vast waters - like the park’s small pond. Explore strange lands - like the playground. Encounter enormous beasts - like a peaceful duck just trying to have an afternoon nap. Children will laugh at the antics of these tiny heroes. There are charming portraits of all the silly characters, and a huge adventure to be had. Written by Marty Byk; Illustrated by JoAnn DiMaggio. Published by Bug Barians Limited LLC, this book is available at your local bookstore. Marty Byk’s children’s book, “The Bug Barians,” is a witty, action-packed story that follows the adventures of five brave Viking bugs. Dressed in full medieval garb, these bugs work together as superheroes… of a different sort. Byk’s characters are well developed and each has something distinct about them. Do not let the title fool you. Although it is about bugs, your daughter will even take an interest when she sees the strong and beautiful female characters. Pig-tailed and stylish, the girl bugs prove that they can be both feminine and strong. These girls can definitely keep up with the male bugs. There really is a character for every child to relate to, and to pick a favorite. Even a Jamaican, dreadlocked bug. I love that the bugs show flaws but make up for lacking in something with other good qualities. It’s brilliant, and sends a great message to children. The illustrations are excellent. Their vibrancy really makes them pop and helps to truly define each bug character. Not to mention, the clever names are sure to make your child giggle. “The Bug Barians” adventures lie in escaping from different, larger animals that they seem to always cause trouble with. Their arch nemesis, the squirrel, makes for a hilarious encounter as you follow them through a chase scene. It’s just another “totally Bug Barian day” for the rowdy crew. I would recommend this book to children 7 years and up because the writing is pretty detailed and has some longer paragraphs. The descriptive writing encourages your child to really imagine the setting and the surroundings of the bug characters. It’s the perfect choice for a child that loves adventure! No fuzzy, sweet bugs in this one—these are the Bug Barians! They’re the fun-loving, adventure-seeking band of Viking bugs in a unique book series for a slightly older, elementary school audience, those learning to read on their own. From Clonk the Clonkerer, the clumsy troublemaker, to Flo, the strong girl bug who always stays calm, author Marty Byk has given us a whole crew of crazy characters that boys and girls will enjoy “sailing” with—on land, sea or in the air. The Bug Barians: Adventures in City Park is the first of a planned Bug Barian trilogy, and it serves as a great introduction to the characters, their personalities and the fun, frenzied situations these bugs can get into. Illustrator JoAnn DiMaggio complements the story with crisp and fanciful artwork that brings the cast and settings to life. But this is more than a picture book, it has 24 pages of bug-tastic storyline that will transport your child to a land of constant action, exciting conflict with assorted park guests—both two- and four-legged—and madcap miniature fun that could occur right in the grass under their feet or in the skies above their head. If your young reader likes stories of bravery in battle … of conquest over foes … and heroic escapes from danger—written in a lighthearted way, of course—I suggest they hop aboard the Leaf Erikson, the Bug Barians’ stout ship, and enjoy conquering new lands (and maybe a new kite) with these new bug adventurers. The Bug Barians interactive Web site http://www.bugbarians.com// contains book ordering links for both paperback and e-book formats, as well as character pages and all kinds of fun stuff. Check it out today. Flights of fancy, more specifically, bug flights of fancy, is what we bring you today. Lorri and I typically review middle grade or YA novels. For this review, however, we took a flight off our usual page and lifted off on the ‘Leaf Erikson’ with the Bug Barians®. Written by Marty Byk, this book brings you a tale of Vikings. However, these Vikings are unlike the Viking barbarians of old. You won’t run in terror from the Bug Barians®, you will want to see more of them because they’ll make you smile. The likes of Clonk the Clonkerer, Eddik the Dread and Flo, march across the page and attack nothing more than your funny bone. When the story was done , Lorri and I found ourselves hoping that these feisty bugs would fly back to earth soon, bringing us another exciting Bug Barians® adventure. Beautifully illustrated by JoAnn DiMaggio, this terrific book is perfect for the 4-7 year olds in your life (that is if they can get it away from you!). Don’t miss this one – just for the fun of it! I love the idea of a Leaf Erickson bug and of Viking bugs in general. Via Mother Daughter Book Reviews I loved reading that the book features a diverse cast of characters including a Jamaican bug and a fabulous female Bug Barian who saves herself and her friends through her own strength. I look forward to reading this book, and I LOVE the illustrations!